We’re off on holidays next week and kitchen decisions have to be made. Normally we drive to France, bringing all manner of cooking paraphernalia (just short of the kitchen sink) and tins full of baking. This year there’s a change. We’re off self catering and Airbnb-ing in North Spain, taking an overnight train to Lisbon and spending some time in Southern Portugal. Unfamiliar kitchens, a range of them. It’s enough to throw any cook in a tailspin. I’ve been making lists. Checking – and weighing – them twice. This, then, is the definitive “can’t-live-without-it-while-travelling” line up. Knife – blunt knives are dangerous and I’ve never discovered a sharp knife in a holiday let. I’m not bringing my best one, just a chef’s knife that can slice meat, chop veg – and cut bread. There’s always a lot of sandwiches and things-on-toast during holidays. We’re flying so this will be well wrapped in a tea towel (also needed!) and tucked into the check-in luggage. Moka pot – can’t live without coffee in the morning. The Kiwi would like to pack the espresso machine and coffee grinder but I’m confining us to this big pot. It’s red, it’s light and it makes enough coffee to get us moving in the morning. Wooden spoon – horrible plastic spatulas and spoons in the kitchen? Ditch them and use a wooden spoon. Mini salt and pepper grinders – because life’s too short to use anything else. There may also be a mini jar of cumin seeds and a handful of fresh bay leaves. Any other suggestions? Everything else, we can sort out when we get there although it’s a pity that I can’t pack the baking this year. With two smallies, we don’t tend to eat out much at night time so simple suppers, often involving salads and eggs (boiled, fried, scrambled, omelette-ed), are the way to go. This lentil dish is something that I’ll be using during our time away. It’s a basic salad that you can make in bulk and change up each time you serve it; add sliced tomatoes and crunchy radishes one evening, toss it with roasted vegetables from a deli counter another, it’s great with goats’ cheese and walnuts, or blanched broccoli and chunks of feta. Best of all, it tastes great in sunshine! 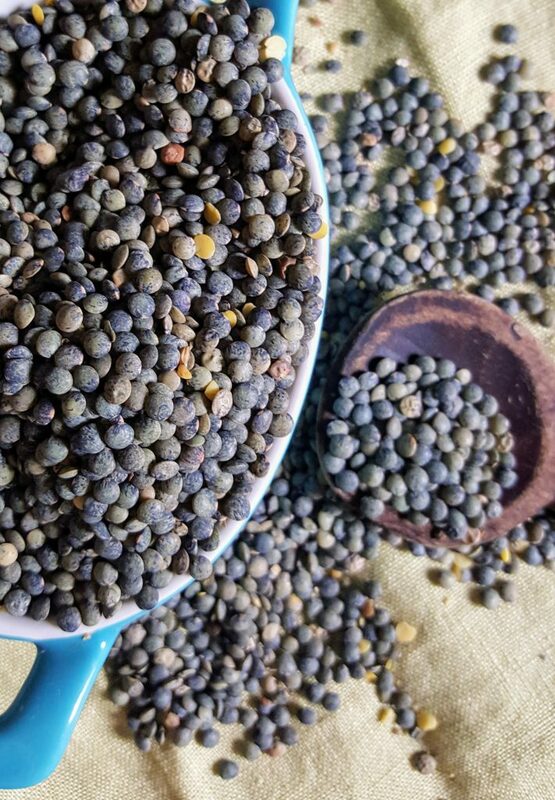 Small green speckled lentils – sometimes called Puy lentils or Lentilles Vertes – can be turned into a salad in minutes. Basically, I cook them till they’re tender, toss them with some vinaigrette – could be made with cider/raspberry/balsamic/red wine vinegar or lemon/lime/blood orange juice and olive/rapeseed oil – and some finely sliced red onion. Serves 4-6, depending on what else you’ve got on the table and keeps well in the fridge. Rinse the lentils thoroughly, put them into a medium saucepan with the bay leaf and cover with cold water by 3-4cm. Bring to the boil, then simmer until cooked – about 20 to 25 minutes – until tender but still holding their shape. Season well with salt and allow to sit for a few minutes before draining. Meanwhile, toss the red onion slices with 1 tablespoon vinegar and a pinch of salt in a serving bowl large enough for the lentils. Leave to sit while the lentils cook. With a fork, mix the rest of the vinegar, olive oil and mustard together. Drain the lentils, tip them into the bowl, drizzle with dressing and mix gently together. Taste and season to taste while still warm. I (shame on me) usually pack in a non-stick pan somewhere. The pans on any let are usually appalling. I’d never say shame on you, Martin! I’ve been known to bring my small cast iron frying pan on trips involving the car. Hate having to use a bad pan. With two small girls, I know that there’s going to be a good bit of eating at where ever we’re staying – it’s always worth having the equipment to do the job properly!